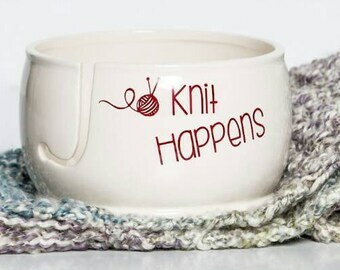 Announcement Hand-painted ceramic yarn bowls, wedding gifts, whale mugs & gifts for the best knitting experience and your favorite bride and groom. These popular ceramics are hand painted in my Charleston, SC studio. WHAT MAKE OUR YARN BOWLS UNIQUE My yarn bowl designs are tested and proven to provide the best knitting experience and crocheting experience savoring your yarn and providing a beautiful project from start to finish. 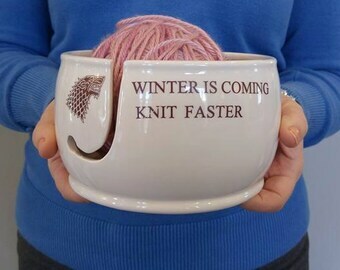 If you are a knitter or crochet artist. You revel in every movement of your fibers and every stitch you carefully produce. As an artist, you deserve to work with something that itself is a work of art. Every Creativity Happens yarn bowl is handmade to the finest artistic and functional standards out of the earth's most beautiful and sustainable ceramic. As a consequence, each designed yarn bowl is a functional artwork that beautifies your crafting environment. OUR PROCESS FOR HANDMADE CERAMICS Each piece is handmade in our Charleston, SC studio by me. After carefully choosing glaze combinations, the ceramics are fired in the kiln. Ceramics are made in stages. They begin as clay and are cast into a mold and fired at high heat to form bisque. Once hand painted and glazed they go through the kiln and fired a second time to a higher temp so the glaze will mature. It takes approximately another 24 hours to cool. This process takes time and that is why you can expect your piece to last forever and be an heirloom for generations. Please "favorite/heart" your favorite your items in the shop to give me the best idea as to what you love and keep available each year. Without you, there is no Creativity Happens! I want to have in stock exactly what you are looking for. I love messages from you guys! Thank you for taking the time to read up on Creativity Happens! 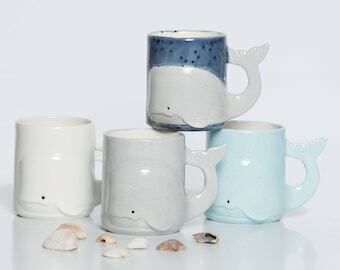 Hand-painted ceramic yarn bowls, wedding gifts, whale mugs & gifts for the best knitting experience and your favorite bride and groom. These popular ceramics are hand painted in my Charleston, SC studio. These bowls are so cool, they look great!! I bought them as a gift and they were a huge hit for my knitting friends. Great seller! Highly recommended. Hi, I'm Barbara! Designing something for you is an honor I don't take lightly. Let's make something fun! 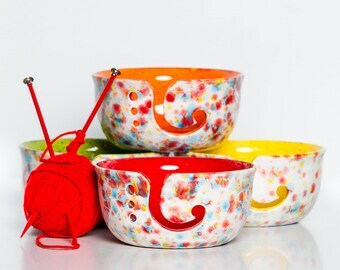 Fun-Fetti colorful and functional yarn bowls are proven to provide the best knitting and crochet experience. Fan Favorite Water Warrior Collection continues to grow. 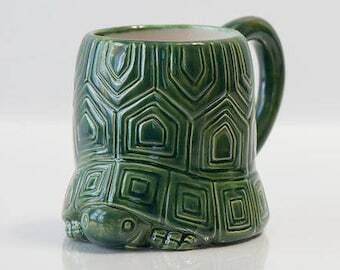 Whale mugs, Octopus, Dolphin, Crabs, Mermaids & more. As an artist, you deserve to work with something that itself is a work of art. Let's personalize your yarn bowl. World Class Artist handcrafts trendy and useful ceramics so you can showcase your individuality. Barbara Rossi can be found covered in paint and lost in creating. Her ceramics are handmade to the finest artistic and functional standards out of the earth's most beautiful and sustainable ceramic. She sees possibilities in the beauty all around her. Spending sleepless nights spinning with new ideas, Barbara is a constant creator and a true artist by nature. Barbara's work focuses on simplicity and creating the unexpected. She is a lively, fun-filled creative soul with a keen sense of humor. Barbara’s gifted creativity began as a child in the basement of her Long Island, NY home by crafting gifts for her large Italian family. While in the US Navy, Barbara’s travels brought her to Charleston, SC where she fell in love with the beaches and local community of fine arts and where she now calls home. Years later Barbara found herself faced with a serious medical diagnosis that reminded her how precious life is. Inspired by life and her desire to pursue her love of ceramics, she brushed off her smock and got to work! Some say she didn't realize the severity of her cancer, but she says otherwise. Setting up shop in her garage she took a leap of faith and invested her savings in a kiln. She believes by staying in her "happy place", she found the strength needed to survive. On that day Creativity Happens was born and is now six years strong. Barbara’s work can be seen at www.CreativityHappens.com where she happily displays her ceramic creations! Barbara Rossi can be found covered in paint and lost in creating. Spending sleepless nights spinning with new ideas, Barbara is a constant creator and a true artist by nature. I love having a family that sometimes lends a hand. Thank you for learning more about Creativity Happens. Creativity Happens makes trendy and useful ceramics so that you can showcase your individuality. You can be confident that when you own a Creativity Happens collectible, you are guaranteed the highest quality and care has been placed in your item. Handmade ceramic yarn bowls and ceramic mugs are fun to make and more fun to own. World Class Artist handcrafts ceramics so that you can be the talk of the party! Knowing someone special is going to own a piece of Creativity Happens Ceramics, is a true honor. Everything in my Etsy shop is made with someone special in mind (I might not know them, but I know they are special). My name is Barbara and I can’t wait to hear from you!